Salmon is one of the better quality protein choices, this isn’t so much because of it’s protein content (although it does rank high) but for it’s rich supply of Omega-3 fatty acids, one of the best sources of Omega-3 you can find. Don’t freak at the word ‘fat’ not all fat is bad for you, these fatty acids helps prevent inflammation, protection from heart disease, aids brain function, and protect the nervous system from damages of aging. When purchasing salmon try steer clear of farmed as they are commonly crammed in pens filled with chemical, waste, and fed synthetic blends. This means less nutritious and likely to be treated with antibiotics you shouldn’t need to introduce to your own body. Buy wild salmon from a reputable source that supports sustainable fishing. 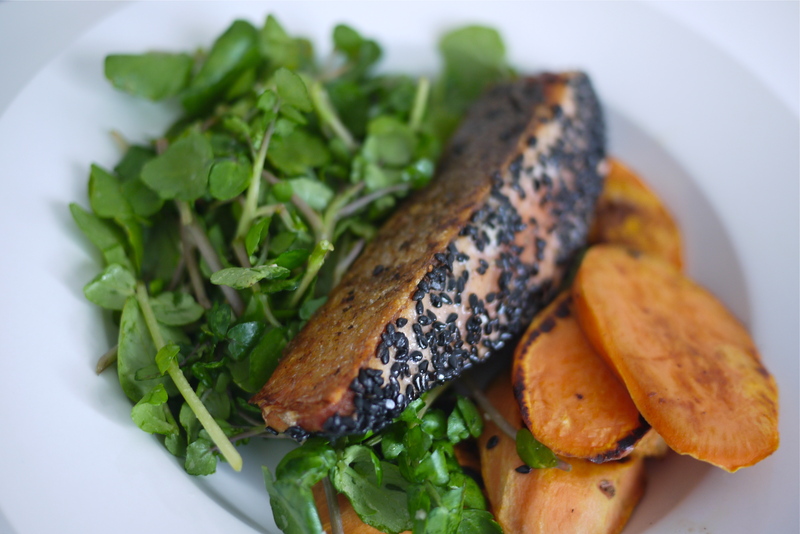 Sesame Crusted Salmon with sweet potato and orange dressed salad. One medium sized sweet potato approx 200grams, peeled, thinly sliced. 2 x 150g Salmon fillets, skin on. 2 Cups salad leaves of your choosing, I opted for an old favourite watercress. 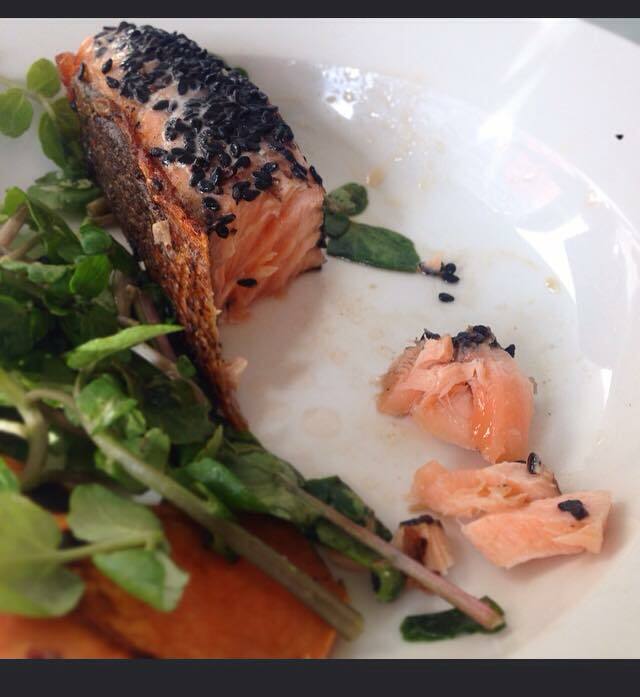 Season the salmon lightly with salt and pepper then place sesame seeds onto a plate and press seeds to coat one side. In a skillet add in olive oil and place over medium to high heat, add in sweet potato and cook for 3-4 minutes per side or until tender. Once done transfer the sweet potatoes onto a a place, set aside and keep warm. Using the same skillet, cook the salmon skin side down for approx 4 minutes, then turn onto the opposite end and cook for 2 more minutes. Meanwhile mix and dress the watercress with orange juice, salt and pepper to taste. You can drizzle a wee bit of olive oil to the dressing if you like, I usually let the salmon naturally take charge of this as it’s being cut into. Divide the meal into two and serve up.